Last call for reservations! Seating is almost sold out. 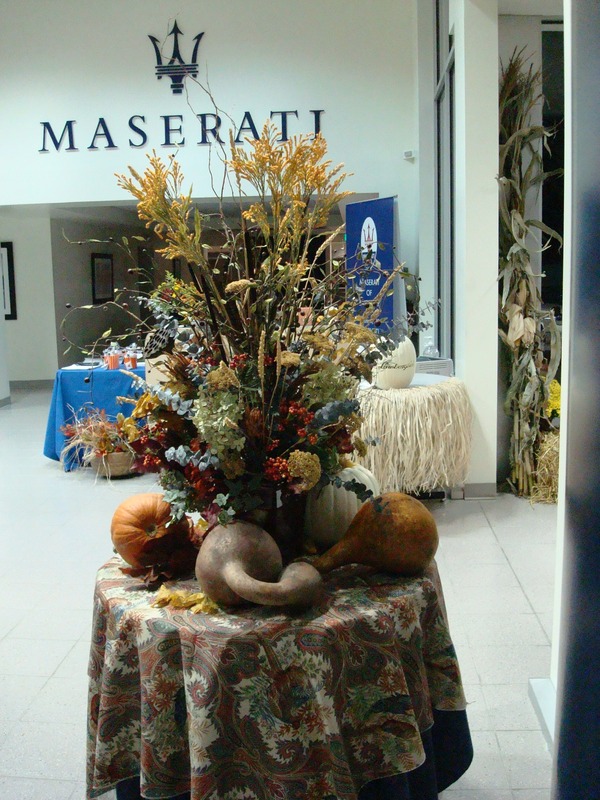 If you or your family would like to “Get Italianized” at Maserati of Baltimore by our friends from Sweet Lela’s Market Cafe on November 9th (2008), send an email with your party’s dinner reservations now. The dress code for this special event will be resort casual–and we who have already had the pleasure of dining at private parties thrown by Sweet Lela’s recommend you wear the most comfortable slacks or outfit that has a gentle and forgiving waistline. Translation? Dress for relaxing, lounging about with family friends, and EATING–and don’t plan to be bashful about your enthusiasm. This food is plentiful, truly rich, and amazing. We’ll be accepting reservations until we have a full house for table seats or until midnight on Wednesday (11/5/2008), whichever comes first. Please indicate how many seats your party will need (the number of guests attending), which menu option that each will prefer (lite fare, full meal, or vegetarian/special dietary optional consideration), and let us know if you will plan to arrive late or leave early so we can save your seats or have doggie bags ready. Lite fare menu will be available for $15 per person and entitle guests to a splendid assortment of gourmet Italian appetizer antipasto selections and a small sweet icy treat with cappuccino after the meal. Full courses menu option will be available for $35 per person and entitle guests to antipasto, soup, salad, pasta entree, decadent desert sample plate, ice cream, and coffee bar. Tipping of 20% gratuity is encouraged. Take home To-GO orders are available with 48 hour advance notice. Formal seating is limited. Reservations made after November 5th, please add $10 to lite fare or multi-course meal option. Sweet Lelas Restaurant reserves the right to vary or substitute menu items for all reservations made after November 6th. Dessert and coffee only option ($15) will be available from 6-7pm with 48 hour advance notice. Vegetarian or special dietary needs will be accommodated to the best of our availability. Please allow ample advance notice in writing by email so we can be sure the restaurant will have your special order ready, with your name on it, and waiting. “Doggie Bags” will be provided to all guests who wish to take home their unfinished meals or to save a bite for later when they are too full to finish eating. We’re also happy to reserve meals to go for anybody who would like to take extra portions home for the fridge, Monday lunch, or those who want to make it but can’t due to schedules conflicting. Please note that the evening’s event is BYOB (been and wine encouraged, hard liquor welcome, specialty favorite non-alcoholic drinks for drivers encouraged). The party itself will begin at 3pm with registration, payment, and check in; Sweet Lela’s daddy and market Cafe owner Antonio “Tony” Iacampo will be on site to greet all guests and to serve antipasto platters family style from 3-5pm. Delicious entree portions will be served as table sit down from 5-6pm. Desserts and cafe style mingling will be from 6-7pm to round out the authentic Italian family dining experience. Throughout the evening, Tony and manager “Vincenzo” will be filling in the gaps between courses of food by regaling diners with stories of both cultural and food preparation history. In addition to honoring Italian heritage traditions, we are also “Sunday Sports” tradition friendly. With several of the Raven’s wives and staff expected to join us for the meal, we’ll also have the away game on for spectator viewing on the plasma screen TV in the galley. Dinner itself will be served round table style in the M.O.B. Exotics Gallery and lucky dining guests will be able to check out the newest in Maserati and Lamborghini automobiles and the finest Ferrari cars while relaxing between bites of everything decadent and tasty. By keeping tables open and easily set up for conversing, all our guests are sure to enjoy listening to stories about the old country, exotic car history, and world traveling freely and openly. WHETHER YOU ARE HUNGRY FOR FOOD, CARS, A TASTE OF THE LUXURY LIFESTYLE EXPERIENCE, OR INTERESTING COMPANY, WE’RE READY. As far as we’re concerned (Jack, the Guest Services Team, and I), there are no strangers in the world: there are only friends we have not met yet. We hope to see you soon. Until then, keep safe and play in traffic. Saturday September 6, 2008 was a day to remember. With Tropical Storm HANNA hitting the Baltimore Coast and making it’s landfall just in time for the “MASERATI OF BALTIMORE RALLY FOR THE TROOPS”, car lovers around Baltimore were discouraged that we had to request our drivers stay off the road and complete their fun run road rally when skies were going to be more friendly. By the time we cleared our last set of guests last night (around 9:30 pm) and headed down to the Afterparty at CIAO BELLA RESTAURANT, we decided Maserati of Baltimore was going to give our spirit awards out by Internet first–before we contacted people to say thank you directly. This first award is for valiant efforts running our road rally and getting the results back to us in a timely manner for grading. Owner Joe Hordubay piloted his 2002 Ford Taurus and made a generous VIP level donation to the USO of Metropolitan Washington. His lovely wife Dotty served as his co-pilot, and helped decorate their RALLY GAME PACK with messages of love and support to all of our volunteers and also included a great message for the troops. Their opinion of the Fun Run and HOLY HANNA Brunch? The USO supports those fighting for our freedom. 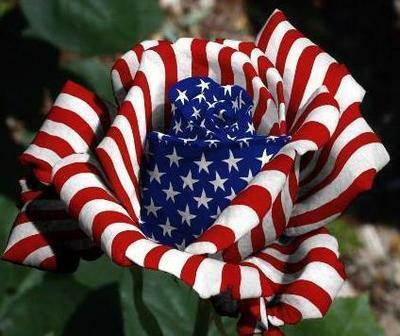 We are grateful to know that our troops are being thanked for their dedication to our country. Great Job! Keep in mind that this lovely couple had no personal military history (they say they have had relatives in the military, but were not involved directly). That makes their enthusiasm supporting our military a perfect example of the people our armed forces are out and about in the world both protecting and representing. Thanks, troops–and thank you Joe and Dotty for showing such dedication to promoting our 2008 Maserati of Baltimore Rally for the Troops. It’s the guests, visitors, and volunteers like you who helped us make this event such a tremendous success, absolutely. Maserati of Baltimore and Adore Entertaining are delighted to announce, confirm, reaffirm, and share with you that SOLDIERS AND VETERANS will be treated to free food and beverages and access to our VIP lounge from 10am to 7pm on Saturday, September 6, 2008 at the “Maserati of Baltimore Rally for the Troops”. Keep those RSVP emails coming and don’t have a care in the world about needing “tickets”. We’re taking RSVP Reservations form all our guests to help us predict the numbers of soldiers and civilians we’ll be feeding throughout the course of the day and your confirmations for participation in either the rally or the car show or both are helping us prepare our gift bags and to plan for parking [traffic]. Other participating food and beverage vendors will have a sign displayed at their booths if showing a military ID entitles you to extra goodies around our festival or showroom. On the house. Free. You are our guests, zero charge. To find the ADORE SIGNATURE VIP LOUNGE, look for the access point near the Signature Flight Support reception area. It will be easy to spot–just look for the large art desk display on loan from MOTOART. You can present your ID to volunteers from Signature. Ask for host Tilman Rawls and Hostess Katusha Poulson-Rawls of Adore Entertaining and they will be sure that you are well taken care of and you can relax and enjoy the sights and amenities of our lounge. SEE YOU SATURDAY, TROOPS–RAIN OR SHINE PLAN TO BE HAVING FUN AND TO BE TAKEN CARE OF THAT DAY. We owe our deepest thanks to you. WHOEVER SAID ‘”THERE IS NO SUCH THING AS A FREE LUNCH” –AT LEAST REGARDING SOLDIERS VISITING MASERATI OF BALTIMORE ON SATURDAY SEPTEMBER 6TH, 2008–WAS ABSOLUTELY WRONG. BALTIMORE WASHINGTON COMMUNITY CHARITY BENEFIT SPECIAL EVENT: Saturday, September 6, 2008 “Maserati of Baltimore Rally for the Troops” is a Morning Road Rally and Afternoon Car Show to benefit the USO Metro. 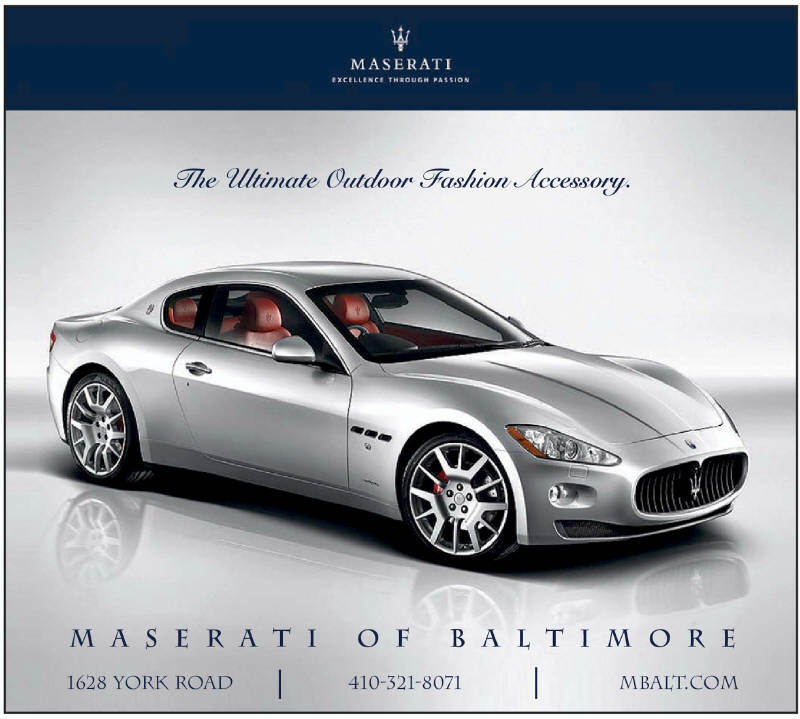 Sponsored areas include Maserati of Baltimore (outdoor area) and the M.O.B. Exotic Car Gallery and Race Fan Boutique (indoor area). The day long festival has an extraordinary listing of community partners and sponsors (listed below). Guests are encouraged to thank our vendors for their support of the USO and troops serving around the world on behalf of the American Public. DEVOTED NETWORKING CAR GUYS AND GALS HELPING EXTEND OUR INVITATIONS: Randy Moss of the COLLECTORS CAR CORRAL, TW and Jeanette Scott (Lamborghini Club members), Chuck Leutner (FCA-MAR member), Kevin Goodman (Maserati fan), Art Cuevas (Porsche Club Member), Neil Stylinski of HIGH ROAD AUTO GROUP, www.mdstreetscene.com, and various members of Ferrari Chat (thank you for your support). OFFSITE PARKING: Please utilize all available public parking lots and residential areas respectfully as a way to offer community thanks for friendly co-operation. SHUTTLE SERVICES: Shuttle courtesy to spectator parking public access lots courtesy of SIGNATURE FLIGHT SUPPORT. Please NOTE: We are in the process of securing shuttle service pick-up and drop off information for commuters parking in excess of .5 miles from our location. Carpooling with other spectators is encouraged. As a green eco-friendly option, the Baltimore public transportation bus also stops directly at our front door, and may be an easy solution for those coming from anywhere around the city or county. Our physical address is 1628 York Road in Lutherville Timonium (Timonium Stop). Early delivery of tents, tables, and non-perishable goods is required. Indoor Set Up 3pm-8pm (volunteers welcome). Early Tent and Outdoor Setup 7am-9am. Food Preparation Breakfast Items 7am-9am. Guest Check In begins at 9am. Breakfast Items and Rally 10am-1pm. Food Preparation Lunch and Festival Vending items 11am-12:30pm. Light Lunch and Afternoon SHOW SETUP (Planned Parking Lot Transition) 1pm-2pm. Late Lunch, Sweet Treats, or Heavy Appetizers and Car Show 2pm-6pm. Professionally Staged Photo Ops, Judging and Awards 6pm-7pm. After Party at CIAO BELLA in Baltimore’s Little Italy. Retrieve on-loan or utilized tents, tables, and remaining non-perishable goods and clean up Maserati of Baltimore on Sunday from 4pm-6pm or by appointment. Read up, everyone, and make sure your subscription to the Baltimore Sun is updated. They are passing word about the community vibe being created for guests by General Manager Jack Davis at Maserati of Baltimore. We’re positive that once the word gets out about community events our exotic car guy and gal friends are participating in, the word on the street passed by our media friends will help inspire more of the car loving crowd to come along and join the fun. Special thanks to Sloane Brown for the awesome write up. 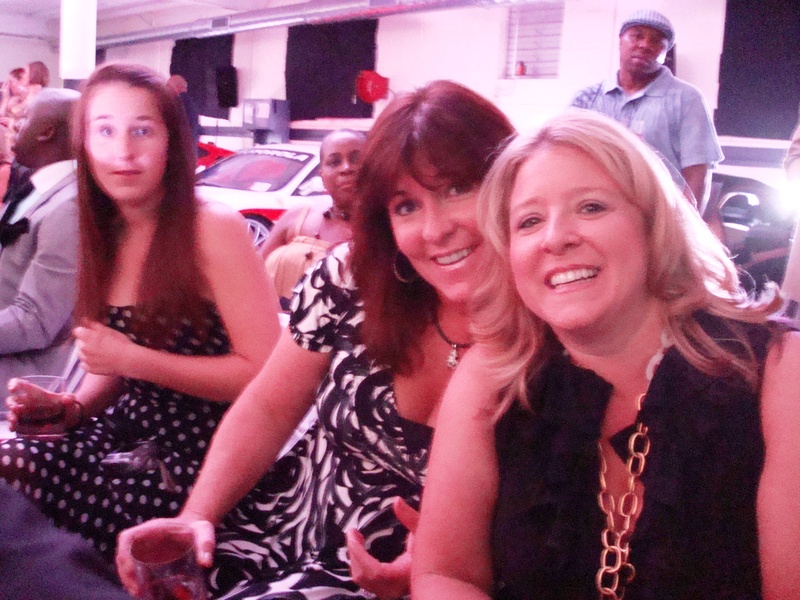 We’re glad to have had you there with us enjoying the http://www.drive2thrive.org fun. 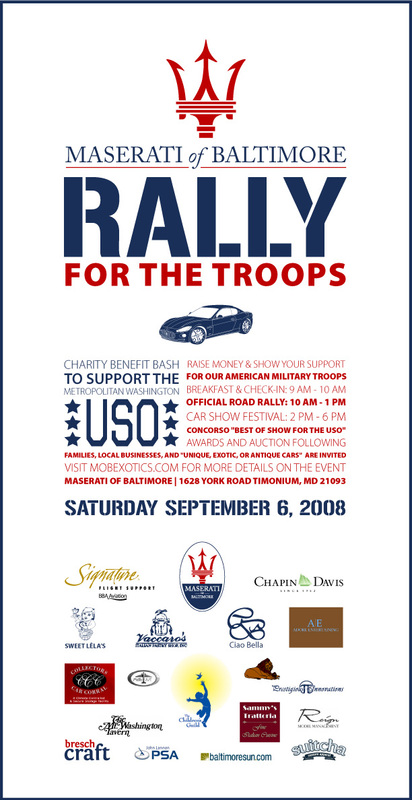 We hope to see you on Saturday September 6, 2008 for our MASERATI OF BALTIMORE RALLY FOR THE TROOPS USO Metro fundraising festival between 9am and 7pm, rain or shine. Many of those same gorgeous models from Reign Model Management will be on hand that day to pose for professional photographs and will be out and about, mingling with guests. We’ll also have that same great DJ Chris Willis “DJ Droopy” from Lions Den Sound working with us who helped put on the fashion show (all thanks to the lovely Ms. Saran Faucett of Reign Model Management), making sure the pulse of the day soothes a world beat afternoon soul and a cocktail hour Italian Classic loving crowd. 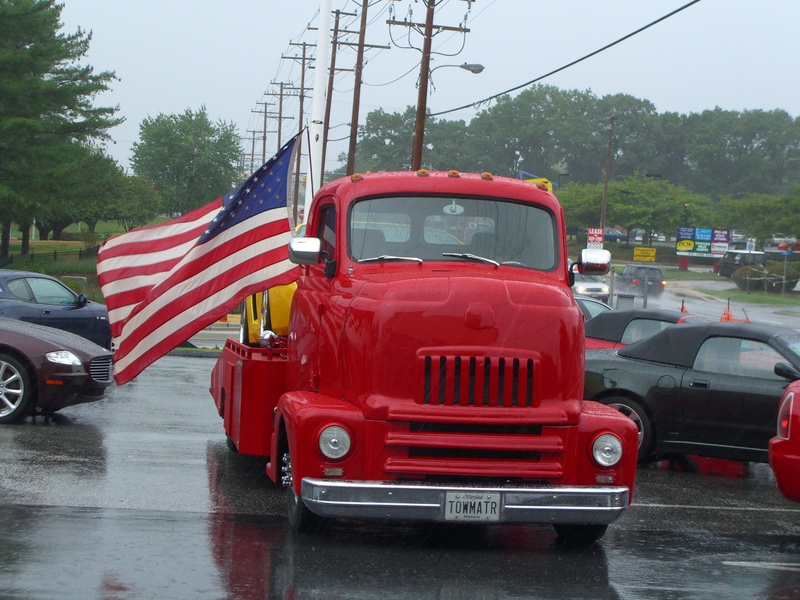 Keep visiting right here for more information about upcoming events in the Mid-Atlantic region for car lovers. To reach Jack or Kae Davis directly with any questions about reservations or sponsorships, email mobexotics@gmail.com and they will be sure to get back to you within 48 hours to help you out. News from the Automotive Industry, often focused on the Maserati segment. One of the hottest spots in Baltimore last weekend was a car dealership, as a couple hundred glammed-up guests nibbled on hors d’oeuvres and sipped cocktails while surrounded by exotic cars at Maserati of Baltimore. Casino games inside and a cigar lounge outside added to the evening’s pleasures. It all led up to a high-end, high-energy fashion show featuring collections from several area designers. And that was inside the dealership’s garage. A very clean garage, we should add.The evening’s high point came after all but one of the outfits had been shown, when… guest of honor, Baltimore native and ” Project Runway” winner Christian Siriano,and the night’s one live auction item – a black chiffon cocktail dress he designed for the occasion. The lucky winner? Siriano himself, who bought the dress for $1,300 and then donated the entire amount to the evening’s beneficiaries: children’s literacy programs. “I know it’s for Maryland literacy programs, which [are] dear to my heart because my mom’s been a reading teacher for, like, 40 years,” he said. “Fierce,” said Baltimore Business Journal account executive Shawn Hyatt. “My favorite part was, obviously, Christian. But the whole event was really well done,” said Harford County attorney Sarah Perry. She and friend Rhonda Miller, research coordinator at Wilmer Eye Institute at the Johns Hopkins Hospital, put on a pretty good show themselves in sleek cocktail dresses and elaborate necklaces. “This is my first runway show ever. I couldn’t believe the models,” said John Lannon, PSA Financial insurance broker. “I don’t go to too many fashion shows. 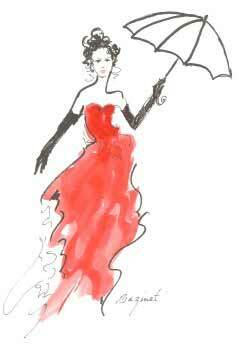 I’m in construction, but … there were a number of dresses I really did enjoy,” said event honoree Ken Banks. Long after the fashion show had ended, the garage remained crowded. A throng surrounded Siriano, each wanting a moment with him. So, how was all that adulation fitting the young design star? “I love it. … Who doesn’t love being adored?” he said, as he posed for photos with fans.